Mornings generally in real life result in waking up early rushing my younger daughter to school making sure she got her breakfast ,coming back home rushing my husband to office and then start getting the house cleaned …arrgghhh….!!!! while all this clamouring buzz goes on its been even more crazier around here lately, with my elder daughters board exams round the corner and endless droppings and pick ups that i was not able to get enough time to bake a fancy cake for a dear friend as was promised ( i know i am a horrible person ) but this humble marble chocolate cake saved the day. Its simple yet elegant the crumb is soo… soft and ohh!!! so yum …. 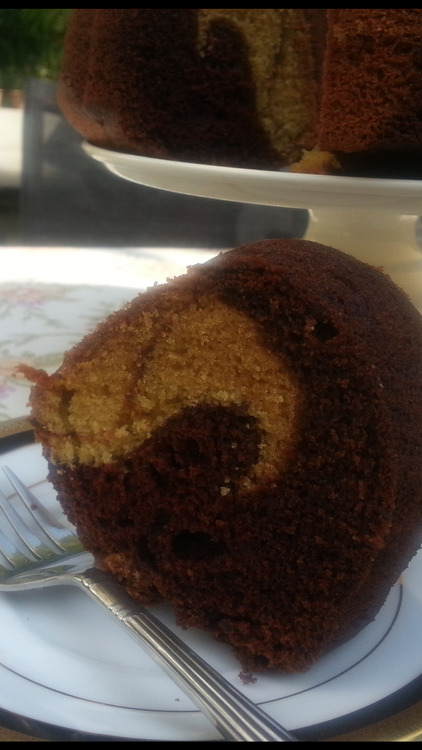 I have used a bundt pan to make it but u could make it in a 9-inch round or square shape . 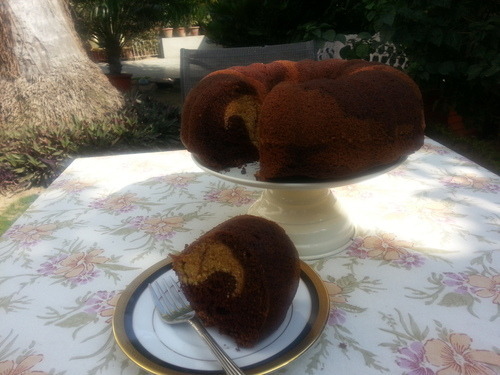 Preheat the oven to 180degree Celsius ,and butter the bundt tin . If you are using a standard type of cake tin, butter the sides and line the base with a disc of baking parchment. Place the butter, sugar and vanilla in a large bowl or in an electric mixer and beat until mixture is light and fluffy.Gradually add the eggs one at a time and beat well .Sift in the flour and baking powder and fold in carefully, then add the milk and mix gently to combine .Tip half of the cake mixture into another large bowl then stir the cocoa and extra sugar and milk through. 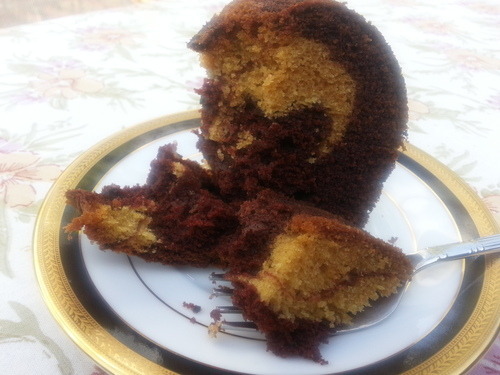 Drop alternate spoonfuls of chocolate and plain cake mixture into the tin .Swirl a butter knife through the mixture to give a marbled effect .Try not to over mix or you won’t get that wonderful marbled effect. Bake for 45 to 50 minutes or until cooked when tested with a skewer. Cool on a wire rack .